If ever there is another petrol famine it won’t unduly worry Ernie Goodfellow. He has just finished restoring one of the best horse-drawn butcher’s carts in the country. Ernie, whose cheery smile is well known to the villagers of Elmswell where he is the local butcher, reckons you would have to go many a long mile to find another one like it. The cart, purpose built for a butcher’s roundsman by J. Deeks and Sons of Clare in 1904, is now decked in bright green livery and sports the neat inscription, “E. Goodfellow, Butcher and Grazier, Elmswell.” Looking no less well groomed is the one horsepower source of locomotion . . . Chancey, a 12-year-old section D Welsh Cob. Chancey himself looks resplendent in a 1930s harness on which every buckle is fashioned in the shape of a horseshoe. Ernie looked proudly at the outfit. 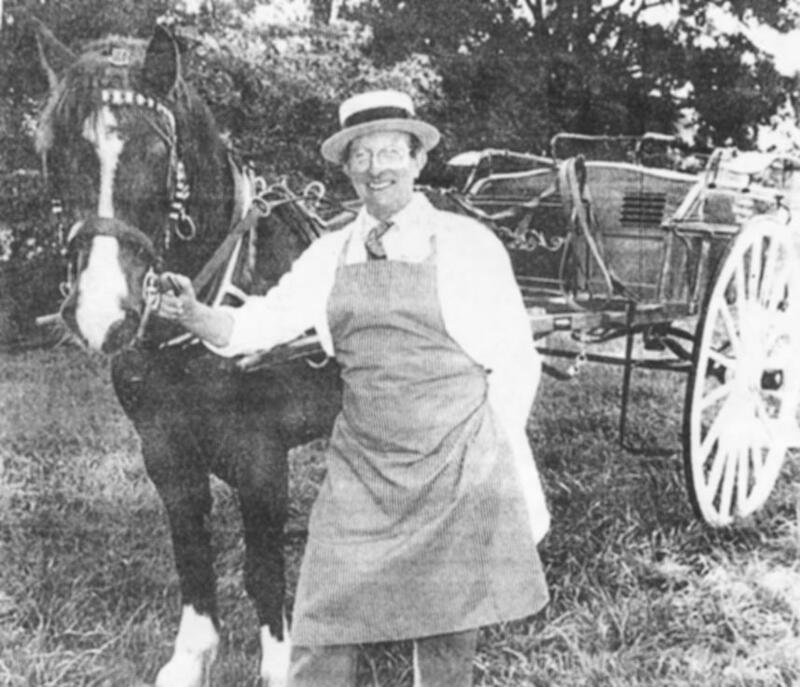 He also has two other horsedrawn carts which he has restored. “I think this may be the most authentic butcher’s cart in the country,” he said. He has been restoring the cart since he bought it two years ago. It had originally been owned by a butcher in Great Yarmouth until 1940; then went to a fish wholesaler in Diss. The cart has two large wooden wheels with solid rubber tyres. At the back is a hinged flap complete with a cutting board on which portions of meat could be sliced up. An air intake helps keep the meat cool. It could carry about a hundredweight and a half.